Now the interior of the cockpit is completely coated with Zolatone, which is a very durable industrial coating used in a lot of truck interiors. We used a 50:50 mix of Desert Camo and White Zolatone. We are pretty pleased at the result! 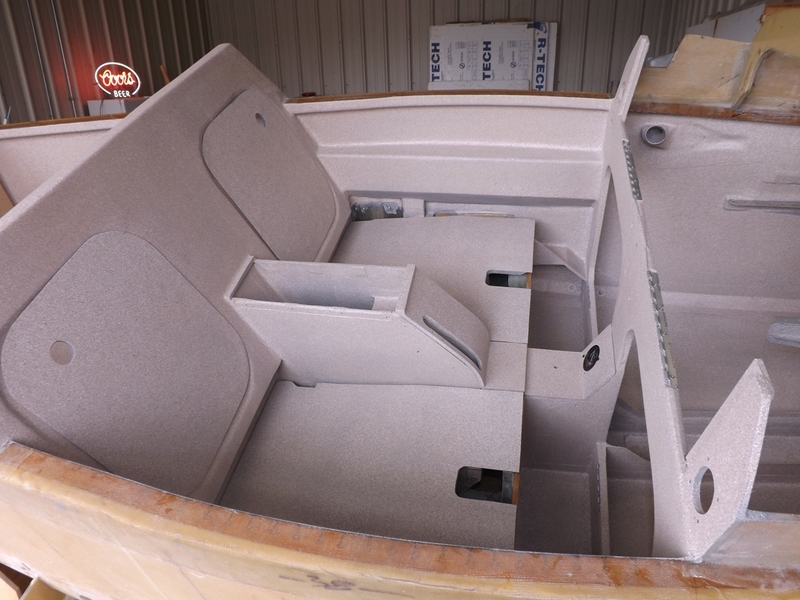 You can see that the seat pans and the seatback panels are also painted with Zolatone. The seatback panels lift out to provide access to our luggage (very small luggage) area. You can see that we have a pretty wide and roomy cockpit (48″ wide, which is wider than most small two seat airplanes). Now we can start installing the flight controls (joysticks, flap lever, rudder pedals, pushrods, fuel lines and some wiring. We are also back to fitting and installing the top and bottom wing skins onto the stubwings and fuel tanks. After the stubwings are completed, we will start assembling the aft fuselage.